High School lockers are incredibly boring, just rows of metal boxes that line the hallways. 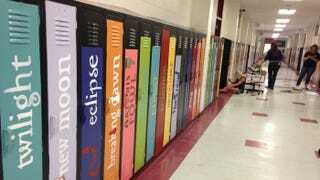 A group of teachers in the Biloxi Junior High School in Biloxi Mississippi decided to change things up a bit, and painted the ones in their school to look like book covers. Their work of art started last fall when two teachers got tired of looking at the old, dull, green lockers that lined the 8th grade English hallway. All 189 lockers have been sealed shut for security reasons for more than 15 years. This is a really cool, creative idea, and as a book lover, I kind of wish that this was in place at my high school while I was there. I’m not sure I would have picked Twilight, though. Maybe Earthsea or Redwall.